Forget about the X’s and O’s, sometimes it’s just about exchanging blows. In a middleweight scrap that’s even too close for the Gambling Gods to call, Anthony Johnson (Pictured) revealed his simplistic strategy heading into Saturday’s shootout with Vitor Belfort. 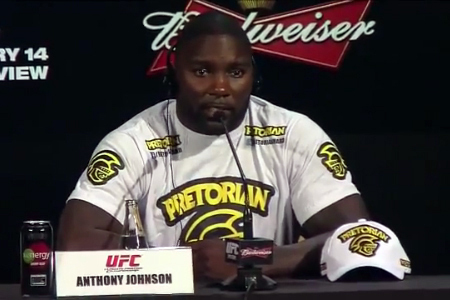 “As far as a gameplan, I’m gonna go in there and just do me – and that’s fight,” Johnson flatly stated during today’s UFC 142 press conference. “There’s no strategy, my strategy is to fight. That’s what I get paid to do and that’s what I’m here to do. “Rumble” will be riding a two-fight winning streak into his middleweight debut. While the prior welterweight has an abundance of admiration for Belfort, who has plenty of experience dabbling in multiple divisions himself having been a former UFC light heavyweight champion, Johnson’s prepared to dive head-first into the 185-pound pond against a dangerous opponent. UFC 142 takes place inside HSBC Arena in Rio de Jenairo, Brazil. Johnson and Belfort will serve as the pay-per-view’s co-featured attraction.